The striking contrast between breathtaking monuments of a glorious past and modern elegant structures is what you will enjoy during your tour of Athens. Visit the Acropolis, the crowning beauty and glory of Ancient Athens, with its many monuments atop its rocky base, including the awesome Parthenon, the Propylea, the temple of Athena Nike and the Erechtheion, with its Porch of Maidens. Drive to the Roman Temple of Olympic Zeus, the Panathinaikon Stadium (the site of the first modern Olympic Games in 1896) and the Tomb of the unknown Soldier in front of the Parliament House on Constitution Square. Witness views of Government buildings and tge elegant structures of the 19th century. Drive along Panepistimiou Avenue and view the Catholic Cathedral, the Academy, University, National Library. In contrast, conclude your tour with a visit to the new Acropolis museum, a marvel of architecture with a full exhibition of the glory of Ancient Athens. This is an afternoon visit of Athens Historic centre, the new Acropolis museum and the Ancient Agora. We begin our visit with magnificent and impressive new Acropolis museum. Admire the wonders of the classical era, the statues and the incredible art samples which at last found their home. We, then, approach Plaka (the neighborhood of the Gods), the old city of Athens. Walking on its paved narrow streets you get the feeling that you are travelling back in time passing by Lysicrates monument, the church of of St.Nikolaos Rangavas (11th century) and the Roman market we reach the Greek Agora. The visit of the Agora, an area which extends over the North-west slopes at the Acropolis concludes our tour. The heart of Ancient Athens, with the imposing temple of Hephaistos (5th century BC) was the place political gatherings and debates, elections, trading activities, theatrical performances and athletic competitions. 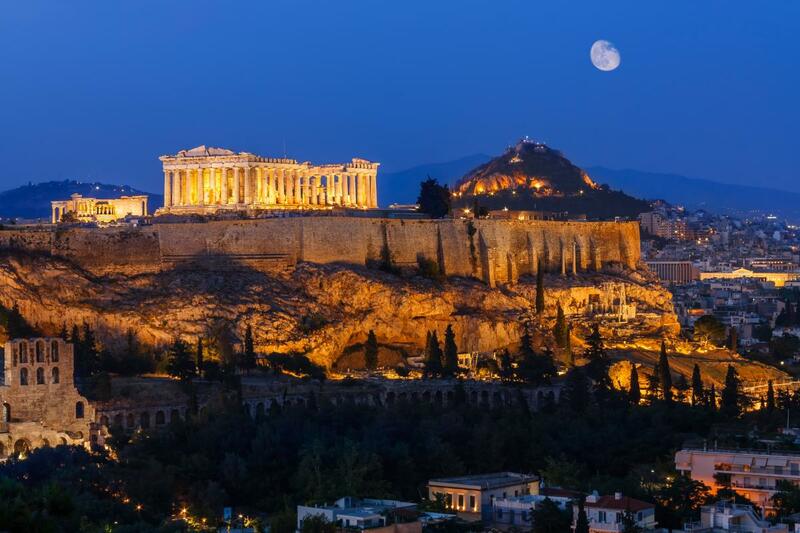 Starting our evening tour with a pleasant panoramic drive through illuminated city center and we will approach the slope of the sacred hill to admire the illuminated Acropolis.Then we will visit the museum of Ancient Greek musical instruments and discover the music history of Greece. Explore the greatest and only collection with 60 reconstructed Ancient Greek Musical instruments. Finally, we will walk through the narrow pedestrian street of Plaka, the old city of Athens, to dine in a Greek typical restaurant with floor folklore show with live music, ballet with Dancers in Traditional costumes. This tour operates daily during summer period 01 Apr – 31 Oct.
During season 01 Nov – 31 Mar it operates every Thursday and Saturday. Take a day cruise from Athens to the fabulous Greek islands of Hydra, Poros and Aegina for a relaxing day on the sea. With all your transport, transfers and buffet lunch organized, you can sit back and enjoy your leisurely day cruise with free time on each island to explore. After transferring from Athens to Piraeus by motor coach, you’ll set sail for the island of Poros, where you’ll have free time for strolling and shopping . Next, it’s on to the island of Hydra. You will have about 1 hour and 45 minutes at leisure to enjoy the unique charms of Hydra island, whose amphitheater shape once served as a safe shelter for Saronic Pirates. From the decks, you will be able to admire the very special architecture and dramatic landscapes of this island, whose old traditional stone houses and mansions silently stand witness to a long and turbulent history. Upon arrival in Egina (Aegina) you can either join an excursion to the Temple of Aphaia (cost not included) or take a walk around the main town. Aegina is one of the Saronic islands of Greece in the Saronic Gulf. The lovely island is only 31 miles (50 kilometers) from Athens, and is a popular getaway for Athenians during the summer months. After sailing back to Piraeus port you’ll be transferred to Athens. Starting in Athens we drive westwards along the scenic coast, until we reach the Corinth Canal with its breathtaking views, taking a short stop to take in the engineering marvel that is the canal. After a short stop, we reach the ancient town of Corinth where St. Paul lived and preached for two years. Back in the ancient times, Corinth was amongst the richest cities and this is quite evident by its remains, including the huge market place and the Apollo’s Temple, constructed in the sixth century BC. After a brief stop at the site of the ancient port of Kechreai where St. Paul disembarked, we return to Athens in time for lunch. This tour operates from 14 Apr-31 Oct every Monday and Friday ONLY in English. The tour does not operate at all during winter period. Driving along the coastal road past the wonderful beaches of Glyfada, Vouliagmeni, Varkiza and countless coves, see the splendid views of the Saronic Gulf. A highlight of the tour is Cape Sounion, dominated by the spectacular Temple of Poseidon overlooking theAegean Sea. This tour operates daily during summer period 01 Apr – 31 Oct. During seasons 01 Nov – 31 Mar it operates every Monday, Wednesday, Friday and Saturday. The tour operates daily in English and every Monday-Wednesday-Friday-Saturday, also in French. Depart from our terminal for one day trip from Athens to Delphi to expore one of the most famous archaelogical sites of Greece. Along the way, you will see the plain of Beotia, an agricultural center and you will also pass by the city of Theva, the birthplace of King Oedipus. You will continue your Delphi day tour towards Mt. Parnassos, making a short rest stop outside the town of Levadia. You will drive then to DELPHI, known in ancient times as the navel of the world. Pass by Castalia Spring, visit at the archaeological site and view the monument of the Argive Kings, the treasury of the Athenians, the Athenian Stoa, the Polygonal Wall, the monument of Platea and the Temple of Apollo famous for its oracle and Delphi museum, with it’s spectacular exhibits include the frieze of the Treasury of the Sifnians, the Naxian Sphinx, the Statue of Antinoos the metopes of the Athenian treasury, the famous bronze Charioteer, originally created to commemorate a victory during the 476 B.C. Pythian Games, and many other artifacts. After lunch return to Athens via the picturesque mountain village of Arachova, built on the south slopes of Parnassus, well known for its attractive hand-woven carpets, rugs and quilts, as well as for its wine and cheese (short stop). Included are: Pick up and drop off at your hotel (or close to it), Lunch, English speaking guide, Entrance fees. This tour operates daily during summer period 01 Apr-31 Oct in English and French. The tour operates every Wednesday – Friday and Sunday during winter. This tour visits the Corinth Canal, Mycenae, Argos,Napflio and Epidaurus before returning to Athens. Travel around the Saronic Gulf to Mycenae, visiting the remains of the ancient city, including the Lionesses Gate, the Tomb of Agamemnon and the Palace. Then the tour travels through to Argos and on to Napflio. After lunch, the tour visits Epidaurus and its theatre, famous for its remarkable acoustics. After, the tour returns to Athens via the Epidaurus / Corinth road. This tour operates during summer period every Tuesday-Wednesday-Thursday-Saturday. During winter period 01 Nov – 31 Mar it operates every Tuesday and Saturday. French every Wednesday-Thursday and Saturday.